Visiting Melbourne Zoo and St. Kilda Beach will get you outdoors. 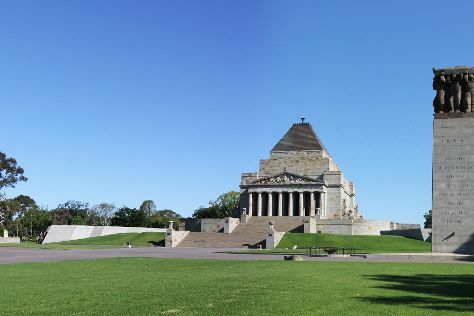 Museum-lovers will appreciate Shrine of Remembrance and The Ian Potter Centre: NGV Australia. Next up on the itinerary: see the interesting displays at Melbourne Museum, contemplate the long history of Old Melbourne Gaol, enjoy breathtaking views from Eureka Skydeck 88, and get interesting insight from Tours. For where to stay, reviews, traveler tips, and more tourist information, read Melbourne planner . Newark, USA to Melbourne is an approximately 27-hour flight. The time zone difference moving from Eastern Standard Time to Australian Eastern Standard Time (Victoria) is 15 hours. Traveling from Newark in March, expect Melbourne to be much hotter, temps between 78°F and 56°F. Wrap up your sightseeing on the 4th (Thu) to allow time to travel to Manly. Escape the urban bustle at Shelly Beach and Taronga Zoo. Do some cultural sightseeing at Whale Beach and Barrenjoey Lighthouse. Change things up with these side-trips from Manly: North Narrabeen Beach (in Narrabeen), Palm Beach (in Palm Beach) and Mona Vale Beach (in Mona Vale). There's much more to do: identify plant and animal life at North Head Sanctuary, enjoy the sand and surf at Warriewood Beach, tour the pleasant surroundings at Balmoral Beach, Mosman, and pause for some serene contemplation at Manly Freshwater Parish. To see where to stay, maps, photos, and tourist information, go to the Manly trip builder . Traveling by combination of flight and ferry from Melbourne to Manly takes 4 hours. Alternatively, you can drive; or do a combination of train and ferry. Expect a bit warmer evenings in Manly when traveling from Melbourne in April, with lows around 59°F. Finish your sightseeing early on the 8th (Mon) to allow enough time to travel to Alice Springs. Kick off your visit on the 9th (Tue): get outside with Walpa Gorge, explore the striking landscape at Kata Tjuta, and then get engrossed in the history at Uluru-Kata Tjuta Cultural Centre. Keep things going the next day: view the masterpieces at Walkatjara Art, then hike along Kuniya Walk, and then admire all the interesting features of Uluru. To find photos, reviews, other places to visit, and other tourist information, go to the Uluru-Kata Tjuta National Park attractions tool . Traveling by combination of ferry and flight from Manly to Uluru-Kata Tjuta National Park takes 4.5 hours. Alternatively, you can drive. Expect a bit warmer weather when traveling from Manly in April: highs in Uluru-Kata Tjuta National Park hover around 84°F, while lows dip to 58°F. Wrap up your sightseeing on the 10th (Wed) to allow time to travel to Esperance. Esperance is a town in the Goldfields-Esperance region of Western Australia, on the Southern Ocean coastline approximately 720km east-southeast of the state capital, Perth. Start off your visit on the 11th (Thu): stroll through West Beach, trek along Rotary Lookout, and then stroll through Esperance Foreshore. Get ready for a full day of sightseeing on the next day: don't miss a visit to Ten Mile Lagoon Wind Farm, stroll through Salmon Beach, then tour the pleasant surroundings at Blue Haven Beach, then stop by Mermaid Leather, and finally take in the exciting artwork at Cindy Poole Glass Gallery. To see reviews, other places to visit, more things to do, and tourist information, use the Esperance day trip planning website . Getting from Uluru-Kata Tjuta National Park to Esperance by flight takes about 8.5 hours. Other options: do a combination of flight and bus; or drive. You'll gain 1 hour traveling from Uluru-Kata Tjuta National Park to Esperance due to the time zone difference. When traveling from Uluru-Kata Tjuta National Park in April, plan for a bit cooler days and about the same nights in Esperance: temperatures range from 73°F by day to 54°F at night. Finish your sightseeing early on the 12th (Fri) so you can travel to Hyden. The town of Hyden is located 292 km east-southeast of Perth, Western Australia in the Shire of Kondinin. Start off your visit on the 13th (Sat): explore the striking landscape at Hippo's Yawn, then take in the dramatic natural features at Wave Rock, then examine the collection at The Lace Place, and finally look for gifts at Wildflower Shoppe. Get ready for a full day of sightseeing on the 14th (Sun): do a tasting at Walkers Hill Vineyard, then take in the dramatic natural features at Jilakin Rock, and then stroll the grounds of Corrigin Dog Cemetery. For traveler tips, reviews, maps, and other tourist information, use the Hyden itinerary planning site . Drive from Esperance to Hyden in 4 hours. Alternatively, you can fly. Wrap up your sightseeing by early afternoon on the 15th (Mon) to allow enough time to travel back home.